There’s nothing more fulfilling – and filling – than sitting down to a real afternoon tea. One that comes with colourful little bites arranged in a gold bird cage and a beautiful pot of tea with cups to match. There are many places right now in Bangkok offering a sweet deal, so take your pick from the list below. And if the day is extra hot, simply have your tea inside or get them to add ice. 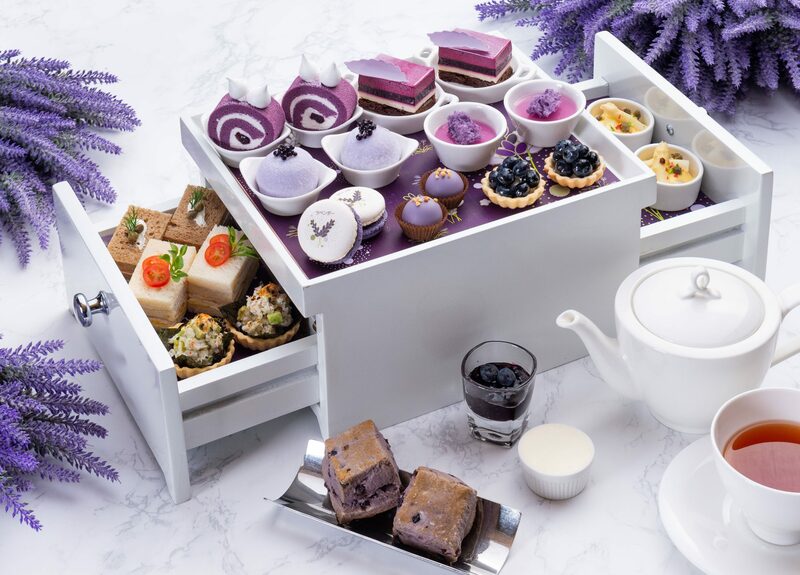 If you like lavender, then you’re in luck, as there isn’t anything quite like the lavender afternoon tea at Up & Above Bar. The beautifully scented flower is a symbol of high summer, coming in deep purples and pale lilacs. Guests can indulge in sweet temptations that include lavender macaron, lavender and bee pollen chocolate, lavender and black current cream roll, lavender wild blueberry cake, seasonal cream daifuku, lavender and blueberry tartlet, potted lavender crème and black current scones, accompanied with artisan clotted cream, jams and marmalade. All of these purple delights make are complemented with a cup of rich illy coffee or freshly brewed premium Saro and Mariage Frères tea. Savoury bites include sandwiches and the Lavender Garden Afternoon Tea won’t disappoint with its fabulous fare, including crab, avocado and nori tartlet, white asparagus with sauce Hollandaise and capers, and a miniature club sandwich of smoked trout layered with cucumber and horseradish on rye. 1,190++ Baht for two. This offer begins on July 1 and runs until September 30, 2018. Available daily from 2–5pm at Up & Above Bar. For more information, visit www.okurabangkok.com. Enjoy an idyllic afternoon with a beautifully created afternoon tea set served alongside canapés and desserts prepared especially by Chef Matt Mittnacht, the executive chef of the hotel. With French influences, the tea set is teeming with strong flavours and heavenly aromas, especially those of rose and French vanilla, two key scents that add to the feel of this Parisian-inspired afternoon tea which takes place in the midst of a blooming rose garden. Expect servings of coconut strawberry panna cotta, raspberry and yuzu mousse, cherry chocolate brownie, berry éclair, blueberry scones and strawberry smores as sweet treats. On the savoury side, you’ll find beetroot cured salmon canapés, charcoal macarons with foie gras and smoked duck on red velvet sponge. 750++ Baht for two. Afternoon tea is served from 2–5pm daily at R Bar. For more information, click here. Taking inspiration from the colour pink, the hotel’s executive pastry chef Frank Braun has concocted an intriguing variation of English afternoon tea, beginning with mouthwatering savoury items such as chicken and mushroom vols-au-vent; cheese ball canapés; salmon rillettes éclairs with beetroot mayonnaise and roast beef with rocket and caramelised onions. Tempting sweet items and cakes are created with colourful pink base ingredients such as strawberries and Roselle to reflect magnificent summer landscapes. The set includes Cinderella cupcakes; red fruit Pavlova and colourful lollipops. Guests may choose their favourite Ronnefeldt tea or freshly brewed Lavazza coffee. 750++ Baht per person. The “Dulce Rosa Afternoon Tea” is served from 2–5pm daily at Hanuman Bar. For more information, visit www.kempinski.com. Surround yourself in picturesque views of the Chao Phraya river while you sweetly sip on a quintessentially English high tea for two. Enjoy a selection of freshly baked homemade pastries and savoury items served on an impressive three-tiered golden birdcage. Highlights include savoury delights such as Kent Ham Dijon Mustard Black Bread, Coronation Chicken on Multigrain Flab, Roast Beef and Remoulade on White Bread Sole, Seared Tuna on White Bread, Scottish Smoked Salmon Cucumber on Whole Wheat. The most important thing would have to be the scones though and the Shangri La’s traditional English Raisin and Plain Scones come with fresh Cornish Clotted Cream and Orange Preserve as well as other sweet decadent delicacies created by executive pastry chef Claus Olsen, alongside a freshly-brewed coffee or a pot of tea. It just doesn’t get more English than this. 1,198 ++ Baht per set for two. This offer is available until the end of July 2018, from 2–6pm daily. For more information, visit www.shangri-la.com. The hotel chain originating from New York spells out the art and science of afternoon tea drinking, with executive pastry chef Thitiphong Suanborae showcasing his take on the tea-drinking legacy espoused at the manor of the Astor family, the wealthy family that founded the the St. Regis. The new signature tea set, “Western Afternoon Tea” uses the signature black tea of TWG, mixed with the freshness of berries and flowers found in the Bermuda triangle. Munchies are served inside a bird cage and customers will be overjoyed with dishes such as Boston Lobster Tom Yum on top of bread, Truffle Puff Mousse, Norwegian Salmon with honey mustard, Orange Cannoli, and an eye-catching Hazelnut Cake. 1,500++ Baht for two. Served at the Drawing Room. This offer is available from 2­–5pm daily. For more information, visit www.stregisbangkok.com. This delightfully Thai afternoon tea set with a summer twist was carefully crafted by the head chef of Erawan Tea Room, chef Achara To-ussami, who pours her 22 years of experience to ensure that every mouthful has a unique flavour. Tea-lovers are spoiled for choice and can choose between butterfly pea flower, beal-pandan, lemongrass and jasmine tea. The tea comes with Thai style canapés that will delight the senses, from those infused with lotus pollen and decorated with lotus leaves to authentically Thai desserts, that come in all shapes and sizes, from colourful petite custard cakes to traditional Thai sweets and mangoes with sticky rice. 1,200++ Baht for two. Served at the Erawan Tea Room. This offer is available daily from 2:30–4:30pm. For more information, visit www.bangkok.grand.hyatt.com.